Exercise Saber Strike 17, the annual training event led by U.S. Army Europe, kicked off with sustainment operations that laid the vital groundwork for the training exercises that would further strengthen the resolve and operational capabilities of the 20 participating nations. Before the exercise was underway, the 1st Infantry Division’s Sustainment Brigade began preparing for the 3,500 U.S. troops who would be training alongside 8,000 soldiers from partner nations that spread across four countries. 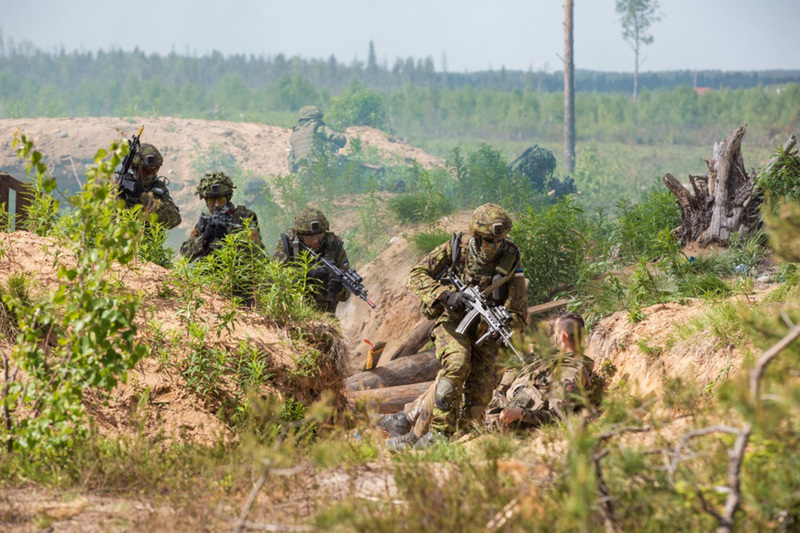 Providing for soldiers in Estonia, Latvia, Lithuania and Poland was no small task, but the 1st Infantry Division was up to the challenge, according to Capt. Christina Shelton, brigade planner for the 1st Infantry Division Sustainment Brigade. “Before the soldiers hit the ground, we had to set up a sustainment network, an architecture that can support all of these soldiers,” Shelton said. Preparations were also made for the exercise’s aviation assets. Capt. Chris Meiser, a commander within Task Force Phoenix, convoyed with his soldiers to Kazlu Ruda, Lithuania. After a few hours of set up, he and his troops were ready to support aviation operations during the exercise. The addition of key support elements to his task force allowed him to establish an airfield anywhere that there was space. “Normally, an aviation battalion falls in on pre-established infrastructure like an airfield,” Meiser said. With the help of a Lithuanian water purification team, and a 1st Infantry Division shower and laundry team, the soldiers at the remote airfield now have life supporting assets and capabilities to keep them operating at full strength for extended periods of time. With the ability to purify 1,500 gallons of water an hour, the Lithuanian team says that working with the Americans has given them a chance to build bonds and build working relationships that improve operational capabilities. “We want to operate at the highest levels,” said Master Sgt. Ramunas Grimalauskas of the Lithuanian Grand Duke Vytenis Main Support Logistics Battalion. Often, the ability to provide things like showers and laundry are overshadowed by the firepower of tanks and aircraft, but Col. Allen Cassell, commander, 1st Infantry Division Sustainment Brigade, said that providing these assets to the soldiers not only increases morale, but also increases readiness in the units by preventing battle injuries. “Adding to the sustainment assets in this iteration of Saber Strike really demonstrates U.S. Army Europe’s ability to support itself, even in protracted engagements,” said Cassell.